New year, new point of view, right? Well thanks to the Snapchat Spectacles it is! So what’s all the hype about, you ask? The spectacles, priced at $129.99, connect to a person’s Snapchat account and automatically save snaps (recorded in a circular video format) to the app without the use of a phone. Another cool feature is that the spectacles automatically charge in its case when stored, which makes it much easier to carry around when you’re out and about. Although after about four recordings, the case itself will have to be charged using a regular cable, which is included. Those lucky enough to own a pair, or two, saw fit to bring in 2017 allowing the rest of us to get a glimpse into their world….literally! For brands and organizations, Snapchat Spectacles brings a new and creative way to connect with audiences, especially when it comes to exclusive content. 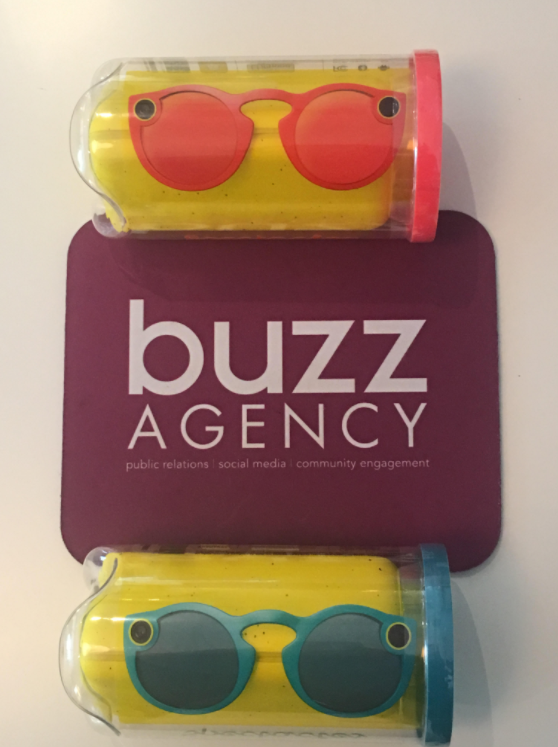 We’re busy here at The Buzz Agency, devising cool ways to put the Snapchat Spectacles to work for our clients (yep, we snagged two pair after a bicoastal scavenger hunt led by our Buzz Bella Rachel and her various relatives across the U.S.!). We have a feeling this isn’t just a ‘toy’ that Snap Inc. execs thought would be fun. Snapchat just raised the bar a few notches and other platforms will be literally looking for ways to catch up.